Title: There Is Only ONE Sequential Prophecy Which Shall Provide Us A Clear Gauge By Which We Can Know The Approximate Time That Antichrist Will Arise! Subtitle: As daily events occur at a rapid pace now, clearly moving the world toward the appearance of Antichrist, people are anxiously believing that the Man of Sin can arise within one or two years. Let us examine that one prophecy by which we can know that Antichrist's coming is truly close. You will most likely be shocked at what we learn. As always, Christians must maintain a firm footing in Biblical Prophecy as we review the swirling events breaking with such great sound and fury all around us. Jesus' disciples asked the same End of the Age question which is on our minds today. For the rest of the chapter, Jesus presented a dramatic, breathtaking panorama of End Times events by which His believers could know that they were living at the End of the Age. But, the very first sentence out of Jesus' mouth set the stage for the mental and emotion threat which Christians at the End Times would face and with which they must daily contend. Imagine that! The first End of the Age prophecy out of the Savior's mouth was a warning against ensnaring spiritual deception! Then, to ensure that believers at the End of the Age got the message, Jesus repeated this warning twice more. At this point, Jesus elected to put an exclamation point on His prophecy. Therefore, unparalleled deception is going to be a hallmark characteristic of the End of the Age. Furthermore, verse 24 tells us that this rank deception would come from two sources. 1) False Christs -- Many people believe this type of person is a religious leader, but that cannot be, because the next type of person the Lord warns about is a 'false prophet', which is most definitely religious. Were Jesus talking about a religious person when He used the word 'Christs', He would have been saying, "For false religious leaders and false religious prophets will arise", and that makes no sense whatsoever. In Ancient Judaism, the word 'Christ' means the office of Messiah. Most Jews believed that office was primarily political, since they were aware of the prophecies that the Jewish Messiah would rule all the nations of the world forever from Jerusalem. That is a political office. 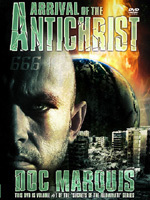 The ultimate 'false Christ' against which Jesus was warning will be the Biblical Antichrist. 2) False Prophets -- This type of person is most definitely a religious person who is speaking lies and half-truths. This is the subject of this article. Today, too many Christians are torn one way and then another and then another concerning when Antichrist may arise; or, most importantly, when the final "Birth Pangs" war will be fought to establish him on the world scene. The Illuminati has been forced by Matthew 24:6-8 to plan a massive set of wars -- three world wars -- to establish their Masonic Christ. Please take a moment to read our article on this subject, NEWS1015, "The Incredible Satanic Vision: Albert Pike's Occult Vision As To How To Achieve New World Order"). 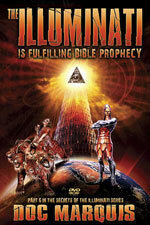 The Illuminati is planning a Third World War to stage their Masonic Christ. 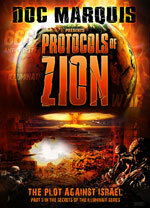 They have already successfully carried out their World Wars I and II and are now setting the stage in Israel to begin the final global conflagration which shall establish Antichrist on the world scene. While most Fundamental Christians accept this premise, they hold widely different views on the precise timing of this global war and of the terrorism and plagues and economic collapse which shall occur in the same time period as the World War III. The prevailing view is that the timetable to the final global conflagration which shall stage Antichrist is very close, i.e., 6-18 months away. One prophetic Scripture gives us a sequence of events which shall enable us to ascertain with a great deal of certainty when Antichrist will arise. If you properly understand this one prophecy, you will not be blown about by every wind of pretended prophetic word from someone. You can stand firmly rooted in your understanding, settling your mind greatly. There is no doubt whatsoever that the "another horn, a little one" is Antichrist, because he is described in typical Antichrist language, "eyes like the eyes of a man and a mouth speaking great things." In fact, Bible scholars have long called Antichrist the 'eleventh horn", based upon this verse. The occult has long assigned the number '11' to symbolize their coming Masonic Christ, another exciting instance to demonstrate that God's prophecy is driving world events. Daniel 2:44 makes it quite clear that, just as God's final kingdom will cover the entire earth, the kingdom of the collective final 10 kings will encompass the whole world. Therefore, we are looking for the establishment of a worldwide final kingdom which numbers only 10 super-nations, symbolized as kings, or horns. 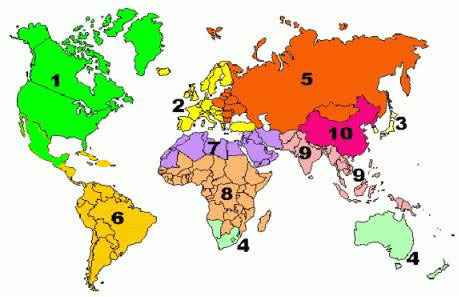 Since there are nearly 200 different nations in the world today, what we should expect to see is a movement to group these nations together so that the final number equals precisely 10! The Illuminati published just such a global reorganization plan in 1974 in a book entitled, "Mankind At The Turning Point". We posted an article explaining this exciting development in June, 1996, NEWS1002, entitled, "NAFTA: The Shocking Rest of the Story". What is their collective grouping together of all nations of the world into exactly 10 nations? 4) Australia, South Africa, and the rest of the market-economy of the developed world. 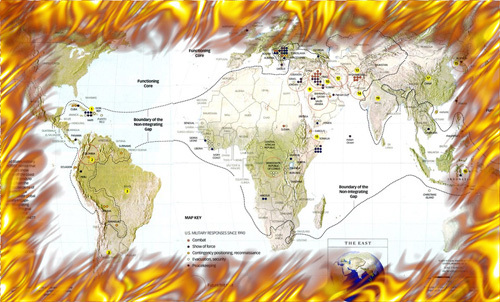 This dramatic fulfillment of this prophecy looks like this on a map. 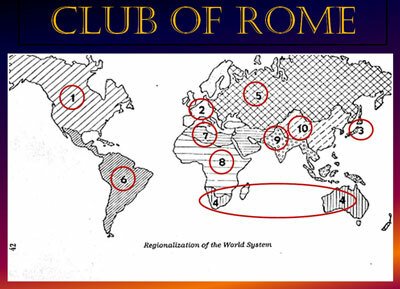 The map on the left is from the original Club of Rome writings, but the map on the right is simpler and more recognizable. Supernation #7, for example, is far more clear than in the map on the left. These prophecies in Daniel are quite clear in predicting that the world in the last days of time, during the 7-year Tribulation Period, will be reorganized into 10 Super Nation States, or 10 Regions. This is a shocking revelation, since the world has been controlled by individual sovereign nations since the Tower of Babel 5,000 years ago. Today, there are over 170 sovereign nations in the world. A new governmental structure is being silently erected over these 170+ sovereign nations Before our very eyes, a new government is being erected; this plan, originally published in 1974 in "Mankind At The Turning Point", is being implemented. And when it is finally implemented, it will fulfill this Biblical prophecy of 10 Nations at the End of the Age. Therefore, you see, NAFTA is not simply an economic super nation; rather, it is the political Nation #1 of this 10 Nation New World Order. Very few people understand this, because they have been falsely conditioned by our national leadership, aided by our national mass media. No one has ever explained this before. Now, you can understand why Presidents as seemingly dissimilar in world view, style and philosophy as Presidents George H.W. Bush and William Clinton could support the creation of NAFTA. President George H.W. Bush began the push to create NAFTA, but was unable to see it created before he left office. President Clinton supported NAFTA, even though he opposed nearly every other thing for which Bush stood. The Clinton/Bush team pressured Congress to pass NAFTA in 1993. At that point, NAFTA more resembled a Free Trade Zone than a new sovereign nation. That was the plan, as the Elite figured it would be easier to pass a Free Trade Zone than a new supernation, where each individual nation would be force to surrender their sovereignty. At this point, I am going to state a truth which I have carefully enunciated throughout many articles: The New World Order Plan was created officially in 1776, and has been consistently supported by Presidents ever since. In this 20th Century, nearly every President, both Democratic and Republican, has secretly supported the Plan for The New World Order. It has not mattered whom we have elected, because both political parties are united in this drive to accomplish this Plan. Generally, Republican Presidents have concentrated on changes in the Foreign Policy field, while Democratic Presidents have concentrated on the needed changes in Domestic Policy. But, whether we have a Republican or Democratic President, the New World Order Plan continues unabated. NAFTA is one example of a Foreign Policy change initiated by a Republican President and continued by a Democratic President. This Scripture absolutely screams "conspiracy"! God has placed the desire in the hearts and minds of these final 10 kings to create a "common policy", a common plan, which will fulfill God's prophecy exactly. This reality is the reason so many of the Illuminati Plans fulfill, or will fulfill, prophecy precisely. In fact, I pay no attention to a portion of their plan which does not fulfill prophecy, because I know it will never happen. Now, let us examine Daniel 7:7-8 again for we shall see the sequence by which we can know with certainty the approximate time when the World War III designed to produce Antichrist is getting ready to explode. ".. I considered the horns, and behold, there came up among them another horn, a little one ..."
Step 2) After the 10 super-nations were formed, Antichrist arises! Therefore, it should be a simple matter to determine whether the world is close to the appearance of Antichrist, or whether we are some years away. All we have to do is keep our minds focused on the formation of the Illuminati Plan for the 10 supernations. With this thought in mind, let us go to this reorganization plan to ascertain its progress. * Western Europe, Nation #2 - While the European Union has most of the trappings of a single nation, i.e., single regional parliament, single currency, abolition of border restrictions, it still is not quite a single nation. In fact, European voters have struck down several referendums which would have gone the final mile in establishing a complete single nation. Now, the Illuminati is trying to figure out how to achieve a single nation without referring the matter to a vote. This supernation is circled on this map, above, and is the only one which will span an entire ocean. It has not started forming yet. Congress originally created this entity as a trading bloc in 1993, fully intending to bringing it to full national status as soon as possible. But, to date, little progress has been made in creating a single parliament, a single currency, and a regional nation without border restrictions. Once President Obama achieves his current goals, particularly establishing an irreversible momentum toward Fascism, he will turn his attention to the North American Union. He has to be very popular to overcome all the obstacles which are now standing in the way. Operating largely in secret through January, 2014, President Obama and Secretary of State John Kerry quietly worked with the Presidents of Mexico and the Prime Minister of Canada to set a framework in place – an infrastructure – which will allow them to move the matter of joining the three nations together rapidly at the right moment in American and Canadian politics. Within the United States, key Republicans are suddenly joining forces with Democrats to “reform” illegal immigration. As a nation is forming, one of the most important issues revolves around the question of citizenship for all people. Since a great many American citizens have real trouble with granting Mexican nationals American citizenship, how can this issue be resolved so that, at the end of the process, Mexican and American people are both citizens of the new nation? I believe Immigration Reform is the silent “Trojan Horse” which will ease transformation into North American Citizenship for people of both Mexico and America. First, Congress grants all illegal Mexican citizens the status of legalized alien, with a clear path toward outright citizenship. After all illegal people from Mexico are proclaimed citizens, native born Americans will feel less opposition to granting North American citizenship to all people living south of the Rio Grande. Canadian politicians have been preparing the people to join this union, and I have seen Editorials which tell all the wonderful things that will happen to Canadian life once the North American Union is reality. While a number of Canadians are opposed to the planned supernation, overall , Canadians seem to be mostly apathetic. One day, soon, seemingly out of the clear blue sky, the President of the United States will announce that the North American Union is now formed. If it is possible, this new Supernation #1 will be set in place in such a manner that a Senate treaty vote will not be necessary. Officially known as ASEAN, this supernation is beginning to reach the point where it can become one, with a single currency, and government. The Association of Southeast Asian Nations ( ASEAN) is a political and economic organisation of ten countries located in Southeast Asia. Members now are Indonesia, Malaysia, the Philippines, Singapore, Thailand, Brunei, Burma (Myanmar), Cambodia, Laos, Vietnam. This current supernation has over 600 million people and a Gross National Product of $2.13 Trillion. But, this supernation is about to get much larger. If you examine the Club of Rome Map, you will see that both Pakistan and India are planned to be part of Supernation #9, known as ASEAN. India is now preparing to also join ASEAN. In mid-May, 2014, India held a nationwide election, in which the old Ghandi Family party was soundly defeated. For the first time in many decades, India had a new Prime Minister from a new party with a new outlook. Indian Prime Minister Narendra Modi is a pro-business Hindu who realizes that the best way to lead India back into financial prosperity is to join India to ASEAN. The current ASEAN nations are already a financial powerhouse; adding India as the Club of Rome envisioned so many years ago will initially help India far more than the current ASEAN nations. ASEAN – without India -- covers a land area of 4.46 million km², which is 3% of the total land area of Earth, and has a population of approximately 600 million people, which is 8.8% of the world's population. Adding India will increase the population by 1.2 billion people, swelling the population of the new ASEAN to nearly 2 billion people! The sea area of ASEAN is about three times larger than its land counterpart. In 2012, its combined nominal GDP had grown to more than US$ 2.3 trillion. Adding India’s GDP of $5.5 trillion will absolutely make the new ASEAN a gigantic supernation, with a GDP of $7.8 trillion, passing Japan as the #3 economy in the entire world. ASEAN plans to be fully integrated into one Supernation by the end of 2015. Her leaders seem to be of one mind and of one determination to meet this deadline. While Russia is now trying to exercise hegemony over the Eastern European nations which were formerly part of the Union of Soviet Socialist Republics, she has experienced real trouble with the Ukraine, Georgia and Poland. In fact, Russian troops recently invaded Georgia but were forced into retreat by firm opposition from the Western Powers. But, events in early 2014 suddenly propelled Supernation #5 into the front of the news! Headlines turned suddenly ominous. “Russian troops … are massing on the Ukrainian border ...."
Russia is attempting to draw into her orbit – Supernation #5 – nations in Eastern Europe, most of which were part of the old Union of Soviet Socialist Republics (U.S.S.R.). The people of Western Ukraine remember the tens of millions of Ukrainians murdered by Communist Dictator, Josef Stalin, and they do not want to return to Russian rule. Russia never actually invaded Ukraine, and probably never intended to do so. She kept troops on Ukraine’s borders as a threat of invasion, but sent Russian troops into Crimea and Eastern Ukraine, dressed in camouflage clothing that was clearly NOT Russian. These “pro-Russian separatists” invaded public buildings, taking them over for Russia and demanding separation from Ukraine so they could join Russia. Crimea actually traveled this route, holding elections on May 11, 2014, in which 89% of the “voters” chose to join Russia, separating from Ukraine. Instantly, Russia had a victory without appearing to launch a war of aggression. On January 1, 2010, Russia formed a new coalition of nations which she called the “Custom’s Union”. Initially, this union was comprised of the states of Belarus, Kazakhstan and Russia. The Customs Union was launched as a first step towards forming a broader European Union-type economic alliance of former Soviet states, and is now called the Eurasian Economic Union. Now the Eurasian Economic Union is in place, beginning to form a central government, economy and military. Just as ASEAN – Supernation #9 – set a date of the end of 2015 to have the super state fully formed and operating, so did the Custom’s Union. On 19 November 2011, the member states put together a joint commission on fostering closer economic ties, planning to create a Eurasian Economic Union by 2015. Therefore, as we can see, economic sanctions by the West are going to speed up the process of creating this "Altyn" currency! Were these sanctions planned for the indirect purpose of speeding up Russia's supernation #5? Instead of creating this currency in 2015, Russia has sped up the process and is creating it now. We know the real purpose behind the Ukrainian sanctions imposed by the West against Russia now, don't we? We have always stated that the prophecy of Daniel 7:7-8 requires that each of these supernations is fully functioning as a nation normally functions: a single government leadership, a parliament or congress, a single judicial system, a single currency and a border that reflects the new supernation. Citizens of the member states of the Customs Union may travel to other member states with just a internal passport, without an international passport. President of Russia Vladimir Putin has stated that his goal is to enlarge the Customs Union to all Post-Soviet states, excluding the three Baltic EU member states. Russia has demonstrated her willingness to go to battle to force any of these nations into her fold. Since forming Supernation #5 is a global Illuminati plan, and since its formation fulfills prophecy, we believe this Customs Union will occur basically as we have laid it out, above. This nation starts just south of Mexico and extends all the way down to Brazil. While Venezuela and Brazil are leading the way in beginning supernation negotiations, this nation has really not yet begun forming. However, since all nations but Columbia are now leftist and most are dictatorial, I believe that this supernation could come together far more rapidly than any of the others. On 8 December 2004, presidents or representatives from 12 South American nations signed the Cusco Declaration, a two-page statement of intent announcing the foundation of the South American Community. The group announced their intention to model the new community after the European Union, including a common currency, parliament, and passport. According to Allan Wagner Tizón, former Secretary General of the Andean Community, a complete union like that of the EU should be possible by 2019. The Union of South American Nations’ Constitutive Treaty was signed on 23 May 2008, at the Third Summit of Heads of State, held in Brasília, Brazil. The Union's headquarters will be located in Quito, Ecuador. The South American Parliament will be located in Cochabamba, Bolivia. The headquarters of its bank, the Bank of the South are located in Caracas, Venezuela. On 4 May 2010, at an extraordinary heads of state summit held in Campana, 47 miles north of Buenos Aires, former Argentine President Néstor Kirchner was unanimously elected the first Secretary General for a two-year term. This new office was conceived as a first step towards the establishment of a permanent bureaucratic body for the supranational union. Once you understand this reality: that some countries and regions are lagging behind the rest of the world in being incorporated into the Global Economy and Government, and need to be boot-kicked into fully joining the world body, you will understand why we are now at war, and why we will keep on going to war, from the Middle East to the Korean Peninsula, to Indonesia, to Pakistan, to Cuba, to Somalia and to East Timor. This entire Pentagon strategic thinking is outlined in a book entitled, "The Pentagon's New Map", by Thomas P.M. Barnett. The author is a professor of the U.S. Naval War College and a Senior Strategic Researcher. 2. Nations who are not now functioning in the Global System and are not likely to do so in the foreseeable future, unless they are kicked into it by U.S. or European troops, or by the threat of invasion. These nations are called the "Non-Integrating Gap". Using this strategy, the Elite also plan to sweep all entrenched dictators away so that Supernations 7 and 9 can be formed. Wars will be fought to lose! This region poses significant problems in implementing the Club of Rome Plan. 1) The region was populated with tinpot dictators who held firm control within their nation. Saddam Hussein firmly controlled Iraq while the religious militant group, the Taliban, held Afghanistan within its tight grip. From Tunisisa to Morocco to Libya to Egypt and to Syria, dictators tightly controlled their nations. 2) Each dictator prevented the economy from developing into the cashless system planned for all nations of the world in the New World Order. 3) Each dictator would refuse to voluntarily surrender his national sovereignty to the regional government planned for this region, Supernation #7. Therefore, President George W. Bush ordered American forces to lead an international military force into Afghanistan in October, 2001, and into Iraq in March, 2003. Both dictators were overthrown, and fighting continued long enough to breed instability in these countries who had become accustomed to stability under their former strongman. Both Iraq and Afghanistan now have no central government powerful enough to resist the pressure to join Supernation #7. We demonstrated that the armies coming against Iraq, the weapons that were going to be used, and the tactics that would be employed, perfectly fit the description of the war coming upon the poor people of Iraq. We demonstrated how perfectly God’s ancient prophecy was occurring precisely as God foretold. However, there were several more segments to be completed. This last single prophecy WILL be fulfilled, to the letter. And, the way in which this nationwide creeping Depleted Uranium poisoning is described to me, this last prophecy will be fulfilled exactly. In Spring, 2011, Western Intelligent services engineered an internal dissident movement within Tunisia, Morocco, Libya, Egypt, and Syria. Dictators were overthrown in each nation, except in Syria, where President Assad is hanging tough, as of this publication. Once Assad is neutralized in Syria, this entire region will be ready to start forming a single government, parliament, judicial system, and currency. Regional government, Supernation #7, will be ready to begin forming. This area includes all Africa below the northern tier. However, South Africa is part of Supernation #4, as their economy is so much more advanced than the rest of Africa. Beginning in early 2013, as America re-committed to withdrawing from Afghanistan, Western military began establishing dozens of bases all throughout Central and Southern Africa. Suddenly, war broke out throughout the region. Sudan vs South Sudan, French troops in Chad and in the Central African Republic (C.A.R. ), African Union forces are fighting “al-Qaeda” in Somalia. African Union troops are drawn from Ethiopia, Uganda, Kenya, Burundi, Djibouti and Sierra Leone. Terrorist bombings are exploding throughout the entire region. The objective is to remove any local dictator that might pose an obstacle to Supernation #8 when it begins to form. Stability must give way to instability. Illuminized Freemasonry operates from the maxim, “Order out of Chaos”. Order throughout the entire African continent is giving way to chaos; out of the scripted disorder, and the scripted outrageous acts committed by both sides of each conflict, the Club of Rome Plan will be established. However, we seem to be years away from seeing these supernations formed, with a single government, a single parliament, a single judiciary and a single currency. The only way this backward region could come together more quickly is if Western governments establish a tight control over the entire continent and force the political and economic changes which would propel Central and Southern Africa into a single nation far more quickly than we can see right now. Therefore, we seem to be years away from the World War III which shall produce Antichrist. However, each supernation is actively attempting to pull together into the 10 supernations of the Club of Rome Plan, a fulfillment of the 2,700 year prophecy of Daniel 7:7-8. Remember Jesus' prophetic words: "See, I have told you beforehand". We must resist any needless fear mongering caused by someone who believes that the timing is very close for Antichrist to appear. Keep this global map and this article close at hand for ready reference. And, watch the Daily News carefully, for we highlight any news related to the formation of any of these 10 supernations. While we are at least 5-10 years away from all of them being formed, events of the day clearly indicate that we are most definitely living in the End of the Age.